C Franklin Ltd able to supply and install, service and demonstrate a quality-based selection of ceiling hoists which have been manufactured to the highest standards to enable the safe and comfortable lifting of patients in a care environment. 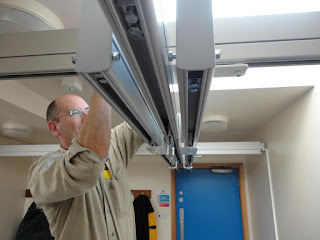 Our high performance ceiling hoists are ideal for lifting patients in or out of bed with the minimum of discomfort and also for bathing and changing clothes. As leading suppliers of safe and reliable healthcare equipment, C Franklin Ltd also provide mobile hoists that are ideal for assisting with everyday tasks such as toileting. If you are looking for a mobile hoist for the heavier patient then we can accommodate your needs with a range of heavy duty options which will easily cope with the additional weight. Slings and hoists are an ideal choice in your home or at hospitals, care and nursing homes. For our supplies and installations we utilize the Invacare and Prism hoist systems, highly trusted manufacturers of quality products that can be installed quickly, simply and at a minimal cost. We also offer superb portable hoists, creating even greater opportunities for economically priced and comprehensive solutions. Our range of sling and hoists repairs, installations includes. At C Franklin Ltd, we offer a comprehensive range of services and solutions for lifting applications in private and industrial services. C Franklin Ltd has enjoyed strong expansion and continual quality and today we offer most expert and comprehensive services, investing in levels of assessment, expertise and service response far in advance of our competitors that has won us work. Our services encompass everything you would expect in supply, installation and servicing, but delivered at a level of detail and care you simply won’t find anywhere else. When we supply and install we look to carry out a genuinely detailed consultation and survey. From detailed on site assessments considering everything down to floor leveling, product adaptability. With expert support and in complete privacy we can completely evaluate each individual requirement; we understand that one system doesn’t “fit-all” and apply a bespoke and adaptive approach. Our assessment engineers configure products to each unique requirement with added or reduced supports, stand and lean or sit down alternatives. Commercial clients, local authorities and architects also gain the benefit of this level of expertise with detailed consultation and advice on making buildings not only accessible to all but also highly practical when it comes to lifting large groups of passengers or moving around goods whether you need industrial scissor lifts or a simple dumb waiter.